From housing and healthcare, to education, employment and mental health services, last year, young people took bold steps to reach their goals and we’re so proud of their hard work. Read more about our work, financials, supporters, events and special guests throughout the last year in our 2017 Annual Report (click here to view). We appreciate you for helping ensure no young person has to sleep on the street again. If you’d like to directly impact our work, make a gift to Larkin Street now. 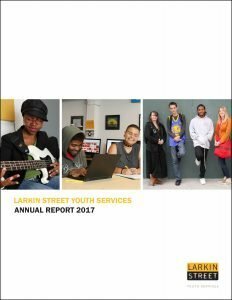 While 2017 brought many challenges, the work to prevent and end youth homelessness continues to build tremendous momentum thanks to Larkin Street’s amazing and dedicated community: our staff, elected and appointed officials, sponsors, donors and volunteers who collectively ensure our vision comes to life and has impact. Sadly, last year, we mourned the loss of two dedicated members of our staff, Candace Freeman and Brendan Dunningan, as well as San Francisco’s Mayor Edwin M. Lee, but remained focused on continuing to make meaningful enhancements to our services at Larkin Street. We reopened the LOFT, our transitional living program for foster youth, enjoyed a stellar Performing Arts Night, and held our most successful Paving the Way gala ever. We also completed our $10 million Growth Campaign, which allowed us to both deepen and diversify our services. In addition to these direct services for young people, we worked to raise awareness at the City, State and Federal levels about what it takes to prevent and end youth homelessness. Locally, we were elated to see a 13% decrease in the number of young people experiencing homelessness, according to the 2017 San Francisco Point-in-Time Youth Count. This decrease occurred during a time of increased investments, both by our supporters through our Growth Campaign and by the City of San Francisco. If these increased investments reduced homelessness by 13%, just imagine what larger investments could accomplish! We’re grateful to see the State of California taking the lead on such investments, beginning with an informational hearing on youth homelessness lead by State Senator Scott Wiener and Assemblywoman Blanca Rubio, followed by a new bill to create a statewide Office of Homeless Youth and direct $60 million in funding to address the alarming rise of youth homelessness in California. Please support these initiatives in the months ahead! 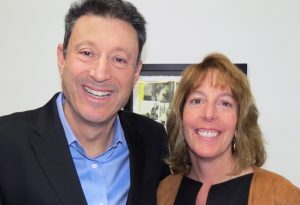 Nationally, the groundbreaking Voices of Youth Count study released by Chapin Hall at the University of Chicago revealed that one in 10 young adults between the ages of 18 and 25 experiences some form of homelessness over the course of a year. Because young people often avoid the streets, such counts are extremely difficult, and without dependable data, policymakers are less able to act. The Voices of Youth Count data has already allowed us to advocate for national public funding through A Way Home America’s policy work to end youth homelessness. The momentum to end youth homelessness continues to grow and we are encouraged by the increased commitments to young people at all levels. Looking ahead, 2018 will bring new challenges and opportunities. We will soon launch an external evaluation of our programs, and begin our next five-year strategic plan, building on the strength of this nationwide momentum. You are invited to join us in the movement to end youth homelessness. We have a collective responsibility – as a community and as a country – to ensure that every young person can reach their full potential. With the right investments and policies, we can ensure that any experience of homelessness by a young person is rare, brief, and nonrecurring. Together, we can end homelessness for all young people.